Thinking of their Sky Swimmer album (released on Sinewave in 2011), I remember a fairly strong and moody post-rock album, somewhat reminding me of summer not just looking at the cover and the band photo. In some of the songs, this mood can be found again on “Pluvero”, but ultimately, after listening through the music several times, this albums appears to be a wholly different kind of work. 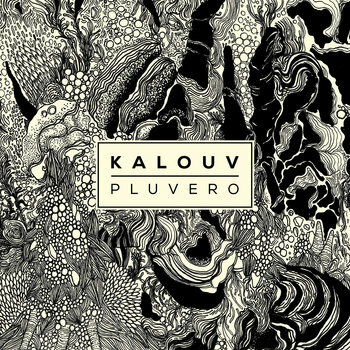 Indeed it seems Kalouv tried rather hard to reinvent themselves during the last couple of years, and it’s obvious they did put a whole lot of work into the ten tracks featured on that album, released in March 2014. There’s just so many things happening in each of these songs, so many different inspirations and ideas in any of the tracks that it’s impossible to mention all of them. The incredible “Eve” by UfoMammut came to my mind in some part of the songs while others (“Durango”) seem partially inspired by progressive or space rock. There are heavier tracks, there are sequences that seem relaxed jazz and piano driven parts, and there are tracks like “Algul Siento II” obviously trying to bring it all together. It’s amazing to see how many inspirations these guys seem to easily put into their music, how they play with harmonies, melodies, rhythms and seem to easily come up with more ideas in a ten minute song than other bands are capable of bringing up on a whole full-length album.